Sick and tired of their natural habitat melting away while the world debates whether global warming is politically convenient, arctic fauna everywhere have apparently decided that if the ice floes vanish, they’re gonna goddamned take over further south. Biologists raised a collective eyebrow at the sight of organized hordes of heavily armed arctic waterfowl swamping outlying towns along the northern borders of Canada and the US, but said there’s little point in studying the phenomenon or doing anything about it. Observers speculate that early reports of individual, starving polar bears and seals and whatnot were actually part of a deliberately staged intelligence gathering strategy. The polar bears now seen are wearing kevlar and carrying surface-to-air missiles. 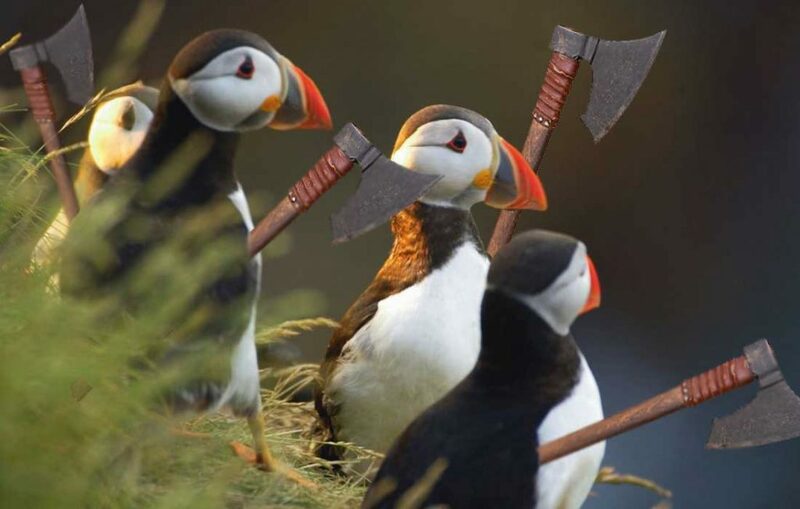 When asked about the invasion, a White House representative scoffed at the notion that puffins are real. Author Gene LaughtonPosted on April 7, 2018 Categories Life, Murica, SCIENCE!